^ Article on BBC Persian. Bbc.co.uk. [16 June 2011]. ^ Filmmaker Jafar Panahi sentenced to six years in prison. The Green Voice of Freedom (part of The Green Path of Hope association). 20 December 2010. （原始内容存档于2010-12-24）. ^ Borzou Daragahi. Acclaimed Iranian filmmaker arrested in late-night raid. Los Angeles Times. 3 March 2010 [3 March 2010]. ^ Federal Minister Westerwelle calls for the release of Iranian filmmaker Jafar Panahi. 3 March 2010. ^ Iran: Indict or Free Filmmakers. 12 March 2010. ^ Panahi arrested for making anti-regime film: minister. 14 April 2010 [2010-04-18]. （原始内容存档于2012-07-03）. ^ IFFR's statement against arrest of Jafar Panahi. ^ TFCA Calls for Release of Jafar Panahi. 16 March 2010 [2010-03-19]. （原始内容存档于2010-03-23）. 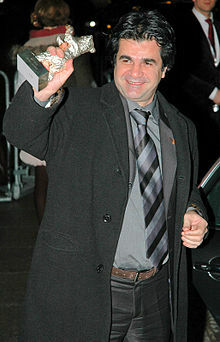 ^ Jafar Panahi Arrest: European Film Academy protests. 5 March 2010. ^ Iranian court upholds sentence against filmmaker Jafar Panahi. AFP. [15 May 2013]. ^ Jailed Iranians win EU prize. United Press International. 26 October 2012 [26 October 2012]. （原始内容存档于2012-10-26）. ^ Saeed Kamali Dehghan. Nasrin Sotoudeh and director Jafar Panahi share top human rights prize. The Guardian. 26 October 2012 [26 October 2012]. （原始内容存档于2012-10-26）. ^ Nasser Karimi (18 September 2013). "Iran releases human rights lawyer, other prisoners". The Associated Press. Retrieved 22 September 2013..
^ Festival de Cannes: Crimson Gold. festival-cannes.com. [8 November 2009]. Dönmez-Colin, Gönül. Cinemas of the other: a personal journey with filmmakers from the Middle East and Central Asia. Intellect Books, Bristol, UK, 2006. ISBN 1-84150-143-3, pp. 90–96. Stone, Judy. Eye on the World: Conversations with International Filmmakers. Silman-James Press, Los Angeles, 1997, ISBN 1-879505-36-3, pp. 385–387.